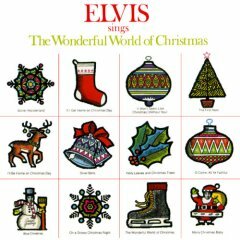 Listening to Elvis' Christmas music, like I always do on December 1 each year, made me remember the time when I bought Elvis Sings The Wonderful World Of Christmas. It must have been in the early eighties. Christmas was a couple of months away but in my favorite record store I stumbled upon the album on cassette. I had never seen it on LP before, but the cassette version suited me just fine, as I'd just bought my very own cassette recorder. The problem was, there was just one copy of the cassette, and as I was afraid somebody else was going to buy it, I had to make my move. Grabbing the cassette, I approached the counter and handed it over to the salesman. "Isn't it a bit early for Christmas music," he asked and smiled at me. I guess he wasn't an Elvis fan, or else he would've understood the importance of that one cassette. After all, it was the only one available in the whole of Stockholm featuring Elvis Sings The Wonderful World Of Christmas. I mumbled something inaudible, paid for my find and and left. At home, it was my turn to smile. Listening to the cassette, I was mesmerized by Elvis' singing, hearing for the first time the title track as well as the bombastic "If I Get Home On Christmas Day" and the incredible "Merry Christmas Baby." Since then I've picked up both the LP and the CD version of the album, the latter one featuring "If Every Day Was Like Christmas" and the remake of "I'll Be Home On Christmas Day" as bonus songs. I had been hoping for a FTD release in time for the Holidays this year, but maybe next Christmas my wish will come true. Mårtenbrother: You're not far from the truth with that! If they follow typical FTD protocol, though, they will release a slightly trimmed version of "Merry Christmas, Baby" on some random album like Promised Land and label it as the "unedited master." Then, a previously unheard and slightly inferior second jam version will appear on the actual Wonderful World album - noted with wrong session date, of course. FTD - we only kid you because we love you! Keep those releases coming. We can get over the little typos.